No guitars, no Dubstep breaks, no angular Post-Punk posturing. Jack Barnett & Co. look to 20th century composers and Fado for inspiration on their austere 3rd LP. 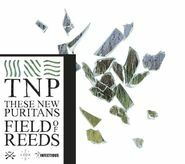 Woodwinds, brass, field recordings, a magnetic resonator piano and additional vocals from Portuguese vocalist Elisa Rodrigues move TNP into a whole other category of artist, further away from the faceless NME hordes they once mingled with. Great Stuff!